I disagreed with Margaret Thatcher on almost every political issue. When she refused to negotiate a peaceful solution to the Falklands dispute and sent a Task Force which resulted in so many deaths she was wrong. The Poll Tax was an unmitigated disaster and it was unforgivable that she used Scotland as a test bed for it. And her attitude to the miners in the strike showed how politically vindictive she could be. 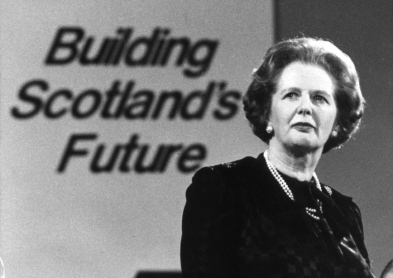 Ironically her support for the poll tax was the genesis of her downfall, the poll tax experiment and other policies imposed on Scotland helped the campaign for a devolved Parliament and her divisive right wing agenda helped to revive the Labour party and lead us to three Election victories. But equally we have to recognise that the success of the Task Force heralded the return of democracy to Argentina. But in spite of all of this she was polite and helpful to colleagues, even bitter critics like me, and helped me on local issues and non political matters. I even had an apology from her when she had mistakenly criticised me at PMs questions on the basis of misinformation. When she introduced Archie Hamilton to the Lords at the same time as my introduction, she was friendly to me and my family, notwithstanding that I was one of her strongest critics. And on her death it would be wrong to celebrate, as George Galloway has done, just as it would be equally wrong not to acknowledge her divisive policies. That is why we should mourn her passing as a person and recognise her failings as well as her achievements in politics. The Rt. Hon. Lord Foulkes of Cumnock is a Labour Party peer in the House of Lords. He is a former MP for Carrick, Cumnock and Doon Valley MSP for Lothians. Follow him on Twitter at @GeorgeFoulkes.